I have two 10G resistors connected in series with a 3V battery. I want to determine the voltage drop across one of them, which of course is 1.5V. When I use my multimeter to check the voltage drop, it reads ~3mV, which I believe is because it has a 10M impedance so the circuit is really one 10G resistor in series with (a 10G resistor and a 10M resistor in parallel), so the voltage drop when the multimeter is part of the circuit is 2.99 mV. How can I measure the voltage drop? Is there something I can build so that that I can adapt the multimeter impedance to be high enough that it won't affect the circuit as much? Rotate the 10,000 ohm potentiometer for ZERO reading. sure, a voltage follower built with a FET op-amp that has extremely low input bias current. If you can get capacitors with zero leakage **, you can hang one across each resistor. Since you are working with DC, give the circuit a few weeks to stabilize, then measure the PEAK voltage. The capacitance required would be such that the time constant RC is several seconds, where R is the load resistance of your multimeter. Not the answer you're looking for? 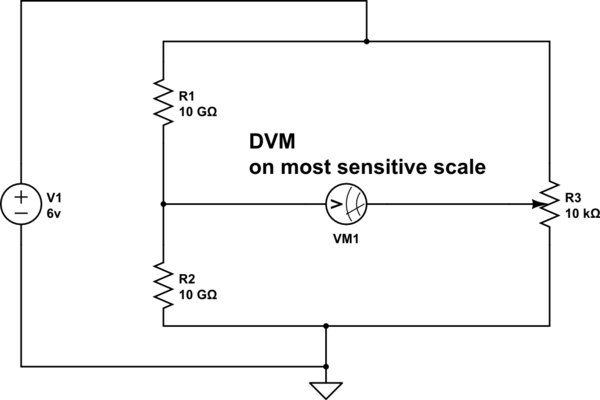 Browse other questions tagged multimeter voltage-measurement or ask your own question. How to measure Voltage & Current with a single multimeter, Simultaneously? Why does a multimeter put more voltage to measure a smaller resistance? Multimeter input impedance and its effect on the measurement of charged capacitor's voltage? 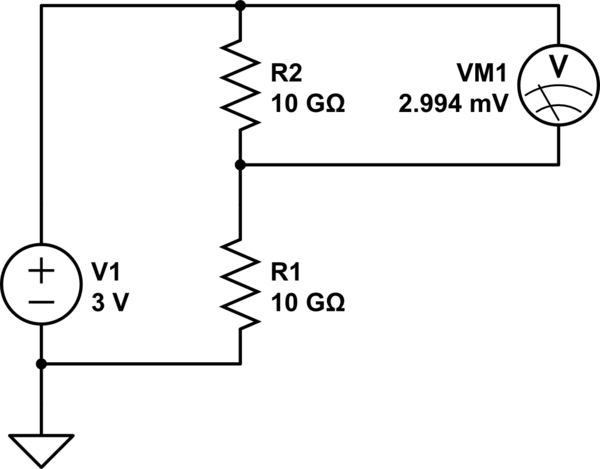 Can I measure the relative output gain of a power amplifier with a multimeter? How to determine accuracy of multimeter? Is it really problem if 0,3 voltage more than required applied in digital multimeter?